As you may or may not know, Lionsheart is the current band of ex-Grim Reaper lead vocalist Steve Grimmett. I'm a big fan of Grim Reaper and Onslaught, another band Grimmett fronted back in the 1980's. Despite my admiration of these two bands, I've never been able to get into Lionsheart. Unfortunately, Abyss isn't an album that will send me in quest for previous Lionsheart albums. 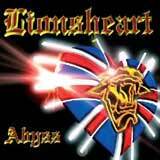 Lionsheart play melodic hard rock, mostly in midtempo range with a few slow and acoustic based tracks added to the mix. If you are a fan of Steve Grimmett, you will undoubtedly enjoy his performance on this album. His voice is rich, powerful, and full of emotion. I find that his delivery is much more disciplined compared to some early Grim Reaper tunes. He used his voice very well, never trying to hit notes beyond his range. The man certainly hasn't lost any power over the years. The musicianship is well executed, with some solid guitar work guiding the album along. There are a few interesting solos to be heard, although I wouldn't say that any of the riffs or rhythms particularly stand out. They are just rather ordinary in my judgment. On the other hand, there aren't any mistakes and it is quite obvious that the guys can handle their instruments. The rhythm section falls under the same classification; tight and efficient with no mistakes, but ordinary and almost boring at the same time. To be quite honest, I can't name one moment on this album that really piques my interest or excites me. The melodies are mediocre and the songs themselves just aren't interesting enough. On a purely musical level, I can't knock the band for making any mistakes or of having poor production. Like I said, these guys are more than capable musicians and their sound is slick and well balanced. The songs are just missing something. If I had to sum it up with a phrase, I would say that this album sounds like a collection of pretty decent B-sides. The songs aren't bad and there is nothing wrong with the band's execution, the songs just simply aren't of a high enough quality to justify a solid recommendation. While preparing this review, I wondered to myself why I was such a fan of Grim Reaper and Steve's performance with Onslaught, but never got into Lionsheart. This review forced me to answer that question. Steve is an excellent vocalist, but sadly, the music found on this album is best stated as average. It's the kind of album that you listen to on Monday and Tuesday and easily forget about by the weekend. As I mentioned above, there are enough positive factors at work on this album to generate some interest (Steve's excellent performance, excellent production, and tight musicianship). However, I feel that many fans will agree that the songs themselves just aren't interesting enough to justify the investment. Therefore I end this review with three words; Try Before Buy.